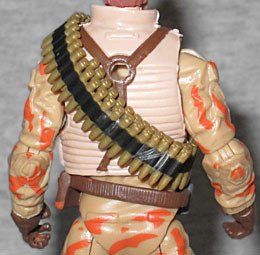 When Larry Hama wrote the initial filecard for the character who would become Spearhead (working names: Frontline, First-Wave), he named the guy Walter C. Hallgren; Hasbro changed it to Peter R. Millman, in honor of one of their toy designers. Now you know! Spearhead was the youngest and most successful insurance salesmas in the Pacific Northwest. It was said that he could sell a term policy to a dead cow. Everybody liked him, trusted him, and bought more insurance from him than they could afford. He denies that guilt was a factor in his decision to join the Army - he simply felt that somebody had to do it. This determination to put the team and the mission before his own personal success made him a natural for the GI Joe team. Spearhead is always assigned the lead position on all combat patrols. He takes this crucial, often hazardous role seriously, working as a lookout to protect his teammates. It's not that he's fearless, but it doesn't hurt that he keeps his pet Bobcat "Max" at his side at all times. You can always count on this duo leading the unit to give it an added punch through the enemy's defensive lines! The original Spearhead (released in 1988) had a rather plain, emotionless expression on his face, but that was pretty standard for the time; it was hard enough to create eyes, a nose, and a mouth, let alone make them look happy or sad. This figure uses the head (and helmet) from PoC Dusty, which is itself rather plain and expressionless - or maybe he's just concentrating. Despite being made entirely from reused parts, the body does a terrific job of looking like an update of the original toy. 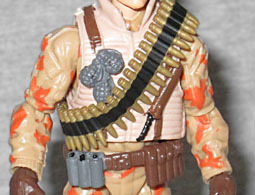 He's wearing Shockblast's vest and change belt, which means the Cobra Trooper torso is beneath it. The arms and legs come from the Cobra Shock Trooper, because they're more interesting. His colors look like they belong to a desert trooper: all shades of tan, with orange camouflage on his arms, legs, and helmet. His vest is a lighter shade than the rest of the clothes, though on the original it was darker. One difference between the original vest and Shockwave's? No string of bullets around the chest - so the new figure gets a loose string of them over his torso! The ammo belt is a mold we've seen a lot of, but the ends have been rubber-banded to form a loop. You could undo them and remove it, but I'm not about to. 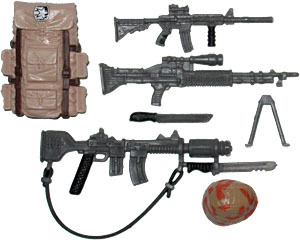 Beyond all that, he has rectangular backpack, a machine gun with removable bipod, an M-4 assault rifle, a machete, and a large, ornate gun with a bayonet, a strap, two clips, and what appears to be a loudener over the barrel. This gun is the same one the original Spearhead came with - not an update, the same one. The only reason Spearhead is memorable today is that he was one of the Joes to come with a pet, his bobcat Max. There was no mention of the feline on the early drafts of the filecard, meaning he was a late addition to the set - they had a cat that could have gone to anybody, and it ended up being Spearhead. Max isn't the same mold as the '80s version: the Collectors' Club sprung for an entirely new sculpt in the Nocturnal Fire box set, knowing they'd be able to reuse it here (yes, Spearhead is another of those figures). It's much more detailed than the original, as you'd expect, but still a little cartoony. The pose is strange: he's bent to the side, but all four feet are nearly in a line, making it hard to stand him up. 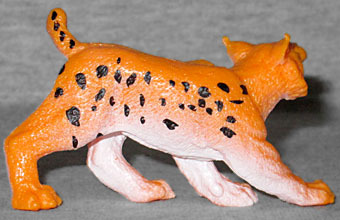 The colors are very simplistic, too: orange on top, white on the belly, and chunky black spots at the top of the legs. Obviously we don't expect a Schleich, Papo, or Safari Ltd levels of quality, but this does not look much like a bobcat at all. Spearhead is a nice, fine update of a middle-of-the-road design, leaving us with a solid soldier toy - not too flashy, not too dull. One of his guns is ridiculous, and Max really needs a skilled repaint to look even half as good as Adam Riches' card art, but overall, this is a decent offering.